Opportunity collided with a hankering. We responded in the only appropriate way: we grabbed our daypacks. A copy of “Balloon Girl” by Bansky. Graffiti on the inside of the Great Barrier Wall. Bethlehem, Palestine. It had been a trying month in Jerusalem. Local unrest, rocket sirens, noisy neighbors, and the smell of old books had taken their toll. Despite these challenges I had managed to finish my publication commitments. There were three days before my next group arrived (from New Zealand). I was determined to do something, anything, to squeeze a little reward out of that window. Issa had his own reasons. So we both loaded lightly. The most important things, of course, were a hat and a full water bottle. Everything else was a luxury. I threw these in my pack. My friend did this same, although Issa was clever enough to remember a package of dates and two plums. It would be enough. After all, this was supposed to be an exercise in stringency, a journey to the edge of the living. David Roberts’ presentation of Mar Saba is stunning. The monastery is perched on the edge of a yawning canyon. The Dead Sea is pictured in the distance. Roberts traveled through the Near East between 1838 and 1840. Upon his return to Scotland he transformed his sketches and memories into a series of lithographs that remain popular to this day. 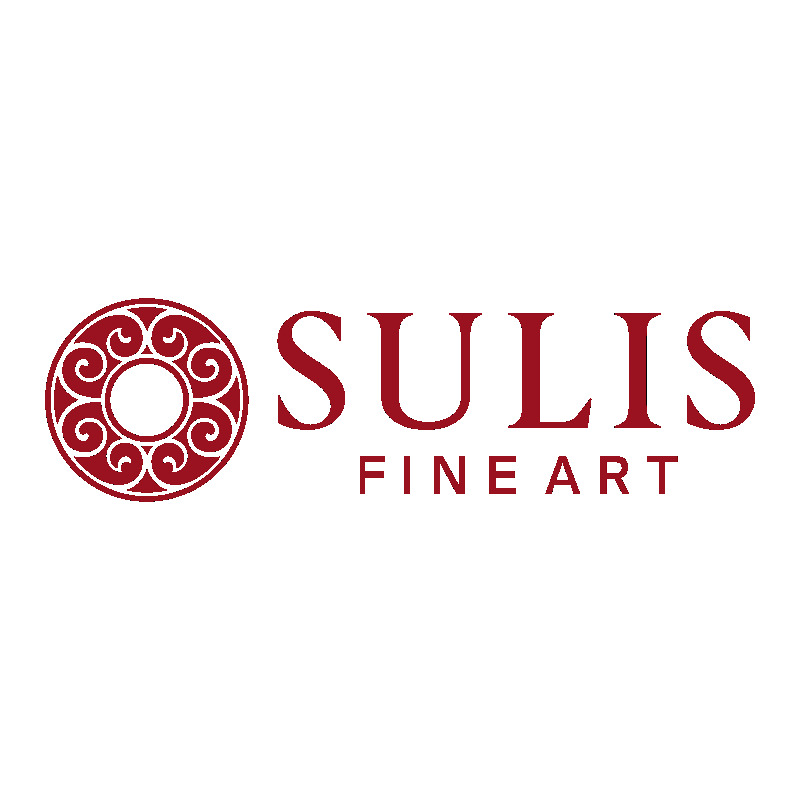 This lithograph was lifted from here. Our goal was a Byzantine site deep in the Wilderness of Judea. Locals call it Mar Saba after its founder, Saint Sabbas the Sanctified. This anchorite was a larger-than-life figure believed to have founded this community in AD 483. Some bold voices suggest that the cloister is the oldest of its kind in the world. It is possible. Everything I had heard about the place had the grit of dusty legend. This included its position. It clings precariously to the wall of a canyon, half-way between the present world and the world to come. But could we reach it on foot? In the high tide of summer’s heat? Another David Roberts lithograph of Mar Saba. His sketch romantically portrays the canyon of the Kidron, a Jerusalem stream that winds through the wilderness and empties into the Dead Sea near Qumran. Image from here. Anyone who has seen the lithographs of Mar Saba can’t help but marvel. The work of David Roberts is simply arresting. Could these teetering towers perched on the edge of an abyss truly exist? Or are they a trick of a watercolorist’s faded memory? I wanted to know. But the lack of opportunity had kept me away. After all, one does not pass these kinds of places accidentally. Who just happens to be in the neighborhood of Sinai and swings by Santa Katarina for tea? Indeed, the solitude that these sites induce bleeds into to the very quest itself. They actively resist discovery; they must be pursued intensionally. 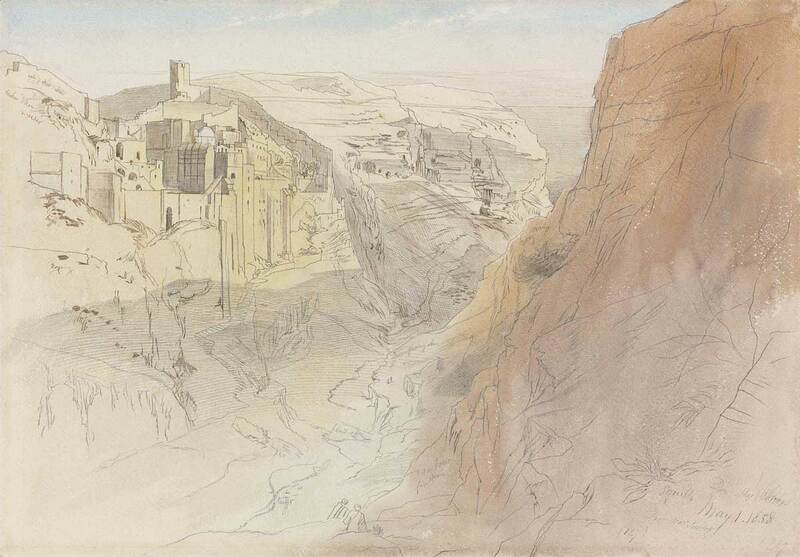 This ink and wash of the monastery of Mar Saba was done in the year 1858 by Edward Lear. His style is quite warm and distinctive, as are his nonsense poems and limericks. Who has not heard of his most famous ditty, “The Owl and the Pussycat”? The source for this painting is here. The closest I had come to Mar Saba was a vicarious experience, courtesy of Helen Waddell. I explored her classic collection of texts drawn from the contemplative tradition while in seminary. I found her The Desert Fathers to be a mysterious—if not frightening—read. Early Christianity seemingly found its feet at just the moment when the rest of the world went wobbly. Some of the fathers chose engagement and attempted to actively reset the world on its bearings; others preferred to disengage and pray for God to work it out (Christian responses to the contemporary situation in the region are strikingly parallel!). Waddell serves up the latter eloquently. Saint Sabbas the Sanctified didn’t appear in this read (that I can remember; will somebody who has access please check me on this?). But he might as well have. He, too, was on the disengagement “Dream Team,” one of these early athletae Dei, “athletes of God.” His journey to the desert began in Capadokia (Central Turkey) in the mid-fifth century. Saint Sabbas the Sanctified as pictured on a Russian icon. Image from here. Our journey began just yesterday. Issa and I walked to the East Jerusalem bus station with little more than an austere idea. We paid our fare and took advantage of wheels as far as the Separation Barrier on the outskirts of Bethlehem. I couldn’t help but remember that a rocket strike had been reported here the day before. We slipped easily through the barrier without a single stop (the Israelis have little interest for what what goes in; what comes out is their concern). More formidable was the gauntlet of taxi drivers waiting on the Bethlehem side of the wall. They were eager to begin their day with clients. We slipped through them as well, but not without comment. Packs on our backs, we began walking into Bethlehem. The morning sun was already warm.